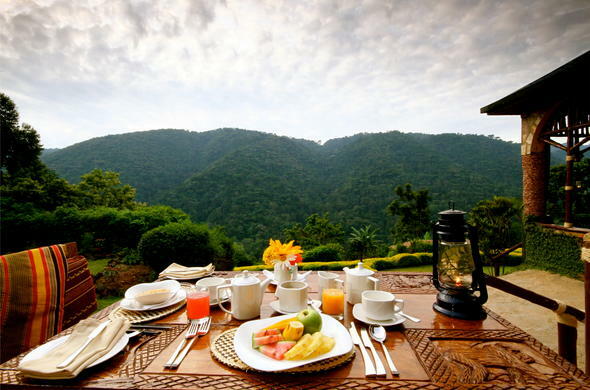 During your Uganda Gorilla tour, you can enjoy various hiking trails that highlight the beauty of the Bwindi Impenetrable Forest National Park and grant sightings of the mountain gorillas, as well as visits to the local communities. The local people take guests on a guided walk through their community where they can experience an average day in the life of the natives of Uganda. Visit a traditional healer, taste banana beer and watch traditional dancing by women and children. Visit the Bwindi Hospital that provides medical care to all the impoverished communities in the region, including the Batwa community. Trek through the Bwindi Impenetrable Forest in search of the mountain gorillas that exist within the thickets of the dense rainforest. These gorillas are the rarest and the most peaceful of all the primates. An early morning hike in this spectacular location will grant you encounters with various bird species, butterflies, trees and perhaps even the primates. Out of the 346 recorded bird species in the forest, ornithologists can sometimes spot up to 100 birds per day. Recorded species include the dwarf honey guide, Chaplin's flycatcher, Montane double-collared sunbird and dusky twinspot. Ride through the forest and the nearby village on a 3-hour guided tour.